Yisrael Beytenu MK proposes legislation to prevent deduction of a third of sentence for prisoners convicted under anti-terror law. MK Oded Forer (Yisrael Beytenu) has proposed legislation aimed at preventing a shortening of imprisonment or “deduction of a third” for every prisoner who was involved in an offense against Israel's Anti-Terrorism Law, which defines what constitutes terror activity and provides guidelines for enforcement against terror groups. If the law passes quickly, it is expected to prevent the shortening of the sentence of a Knesset member who was convicted of smuggling mobile phones to a security prisoner. 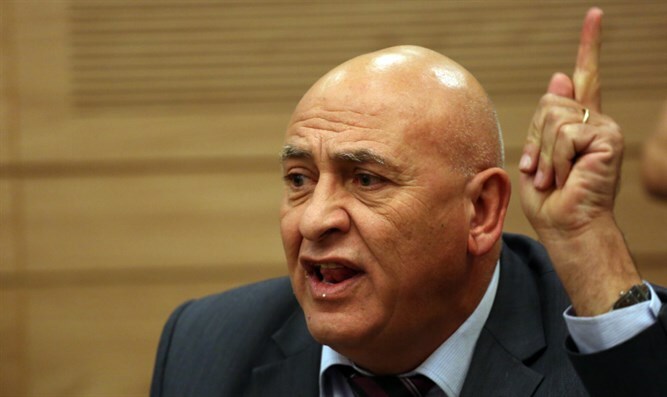 Basel Ghattas, previously of the Joint List, who was sentenced to two years in prison and is scheduled to serve his sentence by July 2019, could be released in a few months if he asks to shorten his sentence, and he has already announced that he would file such a request. "To allow security prisoners a deduction of a third, such as the desire to shorten the prison term of the accessory to the murder of Hadas Malka, is a march of folly that must be stopped as soon as possible. Another former security prisoner, Basel Ghattas, who has been convicted of serious security offenses, may receive a shortened sentence. He is not entitled to this prize of one-third deduction, just like any terrorist who sits in an Israeli prison is not." "Prisoners whose crime stems from deep hatred out of racist and nationalist motives are not supposed be granted privileges like academic studies and cable television, just as they should not enjoy a third of their sentence being deducted. I expect the coalition members to assist in the swift process of the bill and thus avoid the farce of watching Ghattas, too, be released early,” Forer added. Defense Minister Avigdor Liberman, who supports the law, said, "It is inconceivable that convicted terrorists will enjoy a shortening of one-third. It is absurd and we must not leave it even to the discretion of parole boards." It should be noted that only recently did the court prevent the early release of the accessory to the murder of Hadas Malka. However, this bill will provide blanket prevention of deduction of a third of the imprisonment of security prisoners.